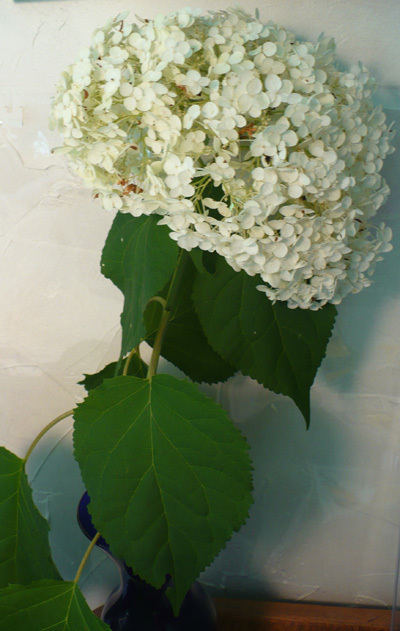 My 'Annabelle' hydrangeas, a dwarf type of "Hills of Snow", bloomed beautifully this summer (as they always do). 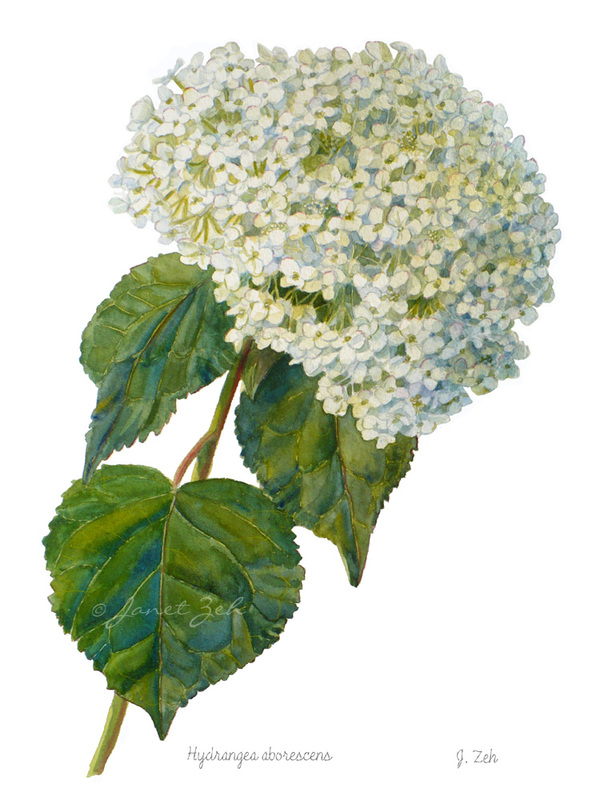 But I didn't have a chance to paint them until there was only one single bloom left that was still white. They turn green after a while, once they are spent. So all were green but one when I finally had the chance to do a painting. I decided to do a botanical, which means lots of detail, but I'm SO happy with how it turned out! (you can click the image to see it larger). First I go out to the garden and cut the remaining blossom off the shrub - sad, but it is the best way to do this. It takes all day and into the night to finish, so if I sit outside, the sun would change too much. And then go down! The flower doesn't look too fresh and happy, but an artist can fix things like that. I set it up in a vase by my easel and shine the light on it so there is a definite shadow side on the right. 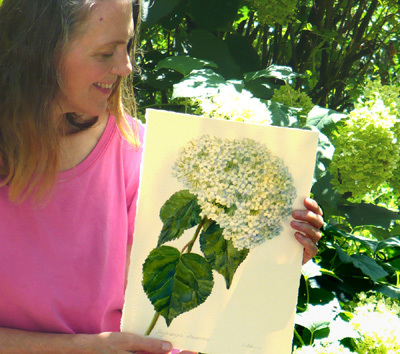 Since botanical paintings are detailed, I draw a rough outline on drawing paper first, then transfer that to watercolor paper. Then I draw in the details on the watercolor paper. 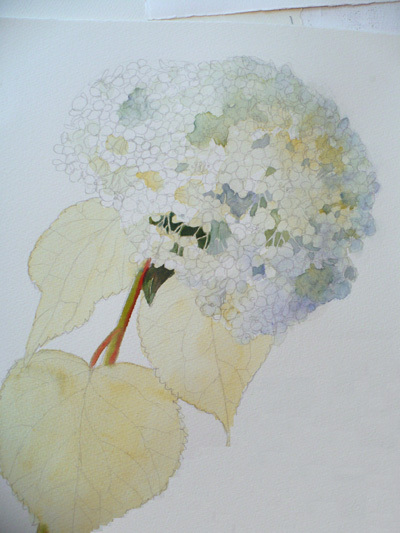 When all the tiny petals are drawn in, I wet the shadow side and paint a pale wash of blue on the far right edge. Look at the photograph above - can you see the blue in the right shadow side? You might see gray. I see blue. Then I wash a greenish yellow onto the middle part where I see yellow in the flower. 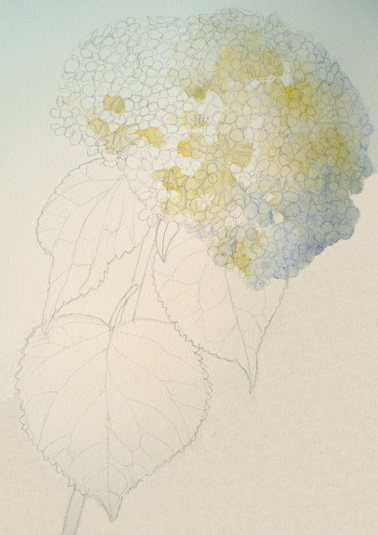 Before going any further with the petals, I paint a pale wash of yellow over all the leaves (below). This is the palest color of the leaves and will show up as veins later on. 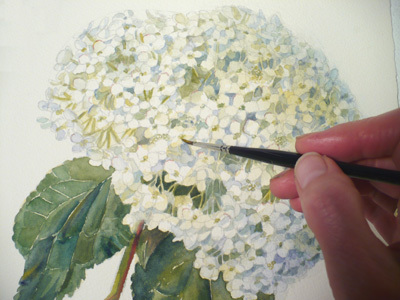 Now is the detailed part - all those tiny flowers that make up the large blossom! I paint around each one with whatever the background colors are at that place, but I don't really outline them, except for those on the edge that might get lost once I erase the pencil marks. Forgot to take a photo of the leaves as I was painting them. But, once the initial wash was dry, I painted shades of green made from yellow and blue onto the leaves leaving pale yellow lines wherever the veins were. I spent all day (and into the night) on this. 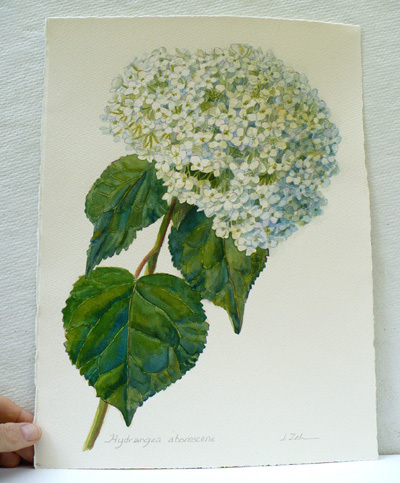 The thing about botanical illustrations is that they should be done from the live plant. If any painting is left for the next day, the flower can be wilted! So, it's best to do it in one go. Here is the finished painting - on 15x11 inch paper. Like it? Thank you Valerie - glad you like it. It's one of my favs!